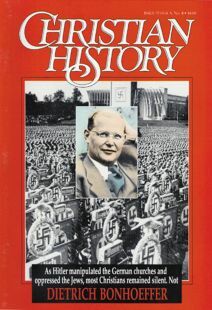 Following Life Together, Bonhoeffer joined the underground resistance against Hitler and became a civilian employee of the Abwehr (the German military intelligence service, whose officers were at the heart of the resistance). He began working on Ethics, an unfinished book that, along with Letters and Papers from Prison, was published posthumously. Basically, he considered Christian ethics to be an ethics of responsibility. Since the Incarnation, God and the world have been “polemically” united. A person cannot relate to the one without the other. This means that ethical thinking can no longer be done in terms of two spheres, one sacred and one secular. In their lives in the world, Christians are called to live responsibly by fulfilling certain divinely imposed and interrelated “mandates"—those of marriage and family, government, labor (or culture), and church. No mandate, wrote Bonhoeffer, is more “divine” than another. Now a Christian must make ethical decisions in the face of various demands that come from being a member of a family, a citizen, a worker, and a member of the church. In 1943 Bonhoeffer was imprisoned. In uncensored letters from prison to his friend Eberhard Bethge, Bonhoeffer raised the burning question of “who Christ is for us today—really.” How is Christ related to a world that has become more and more secular and that does not look to God for answers to its unsolved problems? Is there a “non-religious” understanding of Christian faith that fits a “world come of age"? "Religious” people, contended Bonhoeffer, tend toward individualism (concern for saving one’s own soul for another world), metaphysics (using a concept of “God” to fill gaps in knowledge or to solve personal problems), parochialism (relegating God to only a part of life), or arrogance (thinking God favors them over others). These “religious” views, wrote Bonhoeffer, are anachronistic in a modern, “religionless” world. And they do not accord with the Bible: In Jesus Christ, God lives and suffers with humans in the midst of everyday life. God becomes weak in the world in order that we might become strong and mature. Like Jesus, we are to be there for others in the joys and sorrows of mundane life. Bonhoeffer’s idea of “religionless Christianity” has been controversial (as has his statement, “Before God and with God we live without God"). By it, Bonhoeffer intended that all Christian doctrines be reinterpreted in “this world” terms. For example, the Resurrection is not only the answer to life after death; it sends us back into the world to live in a renewed way.